Russian crews won gold and silver in individual events of the first world tank biathlon championship, which ended at the Defense Ministry's Alabino training range in the Moscow region on Saturday. 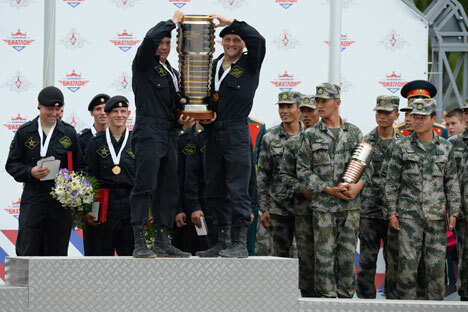 Kazakhstan's crew won bronze, chief championship arbiter Maj. Gen. Yuri Petrov said at the award ceremony. Russian crews won a team victory, too. The Russian team won gold with the best time of 1 hour 13 minutes and 13 seconds. The Armenian team ranked second, 1 hour 20 minutes and 03 seconds, and the Chinese team ranked third, 1 hour 30 minutes and 56 seconds. The Kazakh crew, which had been leading in the finals until the relay race, came fourth with 1 hour 34 minutes and 11 seconds. Penalty points verified by objective control means were important for the ranking. Russian Defense Minister Gen. of the Army Sergei Shoigu personally awarded the winners. The championship featuring tank driving and machinegun and cannon fire was held in Alabino on August 4-16 and involved twelve countries: Russia, Angola, Armenia, Belarus, Venezuela, India, Kazakhstan, Kyrgyzstan, China, Kuwait, Mongolia and Serbia. More than 20 states sent their observers. The tank biathlon championship had over 70,000 viewers, the championship organizing committee told reporters on Saturday.